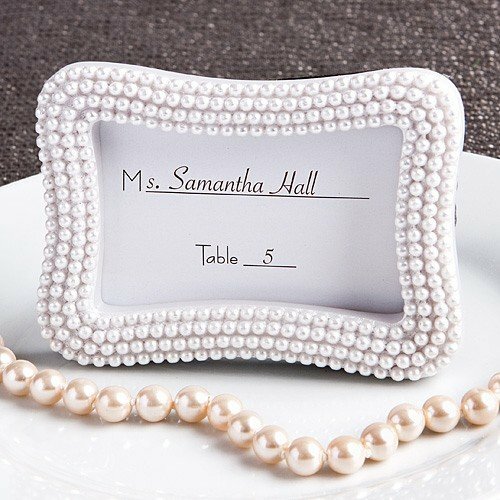 Add a touch of elegance and style to your tables with our gorgeous Pearl Place Card/Photo Holders. These are both a great gift for your guests and a wonderful way to add charm to your tables! Perfect for any occasion including weddings, Sweet Sixteen or Quinceanera celebrations, showers and more! These frames are made of durable poly resin and feature a white pearlized finish in a design that appears as delicate strands of pearls around the frame. Each frame is packaged in a white box with a "For You" tag and includes a blank place card. Each frame measures 3.5" x 2.5" and has a central window that will fit a 2" x 2.75" photo or place card. The easel will allow for either vertical or horizontal display positions. 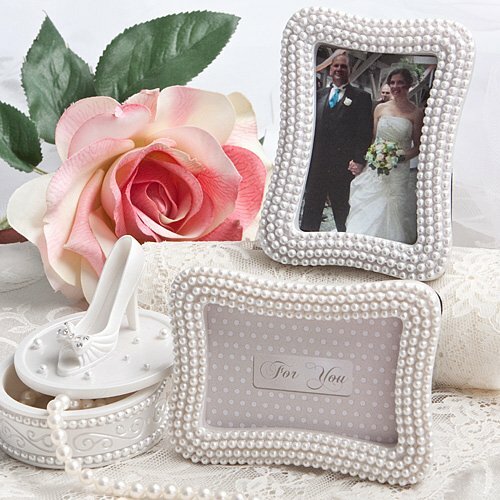 Here you have the Pearl Place Card Photo Holder by Fashioncraft. Comes in a nice sturdy box to protect the item as you can hear from the cardboard. You open it up and it is in bubble-wrap to protect it. And look at that, it's really nice. It's about 3 X 2, I would guess, and have nice pearls all around the frame and a little holder in the back, so you can see as it displays your photo or name card. These place card holders do not offer any personalization options. However, you can find our personalized tags, stickers, ribbons, etc that are sold separately by clicking here. Where would the frames coming from and how long would it take to recieve 2,000? It would depend on what zip code they're shipping to, but generally it would be about 5-7 business days. You can add the items to your cart with your zip code and we'll provide accurate delivery date information. 1 qty is considered a Sample. Shipping on all samples is set at 5.95.